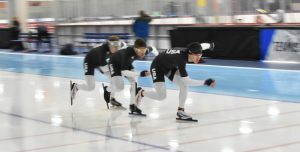 Is Glen Ellyn’s Ethan Cepuran the future of Illinois speed skating? Ethan Cepuran was simply trying to make it through the 2018 Junior World Championships with at least one top-20 finish. After two days of skating against some of the world’s best up-and-coming speed skaters, the Glen Ellyn native hadn’t finished better than 25th. He even described his performance as poor. Then, came the mass-start event. Cepuran, who originally didn’t have spot in the mass start – an event where all competing skaters race at the same time – won silver in the race to secure that elusive top-20 finish. Cepuran’s silver rounded out the seventh top-20 finish for Team USA at the junior world championships, and also placed him firmly on the radar for the 2022 Olympics. He also might be one of the few Illinois skaters who could extend the state’s 94-year streak of sending at least one speed skater to the Olympics. Of the four Chicago-area speed skaters to compete at the 2018 Games, one has announced he would retire, while the others’ futures are up in the air. Glenview’s Brian Hansen said he most likely will retire from speed skating after the end of the season, while fellow Glenview native Lana Gehring and Chicago’s Shani Davis’ futures are unknown. Oak Park’s Emery Lehman was also unsure of what he would do in his skating future, but said before the Games he would take time off to focus more on his schoolwork at Marquette University. Cepuran, who competes in nearly every event in long track, said the next Winter Games in Beijing are a goal for him. He’ll even take off a year of school once he graduates from Glenbard West to focus specifically on training. Eric Cepuran, Ethan’s brother who coaches him and Lehman, said Ethan’s Olympic dreams aren’t misplaced. Ethan said he draws a lot of inspiration from Lehman and Davis, two skaters he studied while improving as a speed skater. Like most serious speed skaters, Ethan trains at the Petit National Ice Center in Milwaukee. Hansen and Lehman also train at the Petit, allowing Ethan to get training and skating advice from Chicago-area Olympians. He even had high praise for Davis, whom Ethan said he knew his entire life. Eric said his brother’s versatility is what gives him a great chance to make the 2022 Olympic team. While Ethan prefers the 5,000-meter race, his prowess in the 1,500-meter, 1,000-meter and mass start is what will make him stand out in the next Olympic cycle. “When you start talking about the team events, that versatility is helpful in that conversation,” Eric said. However, while Ethan said he wants to improve in every aspect of skating in general, Eric said his brother has to work on being more consistent with his results over the next four years. Although Ethan seems to have the best Olympic chances of any current Illinois-area skaters, he said he doesn’t believe he’ll be alone come 2022. Austin Kleba, a Campton Hills native, is also on the U.S. Junior Worlds team and recorded a ninth-place finish in the 500 meter. Ethan also believes Lehman will be back for a chance at his third Olympics. Four years is still a long time away, and Ethan noted many things could change during that time. However, Ethan said the speed and competition that comes with speed skating is what keeps him excited about his sport.